During his meeting with the CEOs, PM Modi also said that India attracted the largest amount of foreign direct investment (FDI) as a result of the NDA government's policies in the last three years. 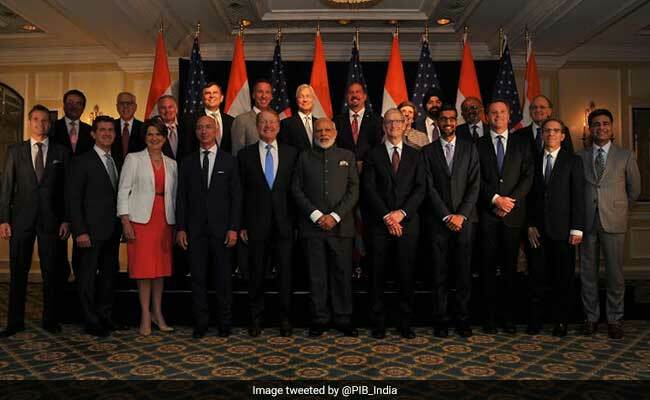 Prime Minister Narendra Modi met CEOs of 20 American giants during his two-day visit to the US. Washington: Prime Minister Narendra Modi on Sunday said India has emerged as a business-friendly destination and invited CEOs of top 20 US companies to invest in the country. He added that the upcoming implementation of the GST, which he called a game changer, beginning next month will create more business opportunities. In the round-table interaction with the group, including Tim Cook of Apple, Satya Nadella from Microsoft, Sunder Pichai from Google, John Chambers from Cisco and Jeff Bezos of Amazon, he spoke about the reforms undertaken by the government since it came to power in 2014. He said the world is now focused on India's economy, especially in areas like manufacturing, trade, commerce, and people-to-people contact, due to a young population and a rising middle-class. "The whole world is looking at India. 7,000 reforms alone were undertaken by the government of India for ease of (doing) business and minimum government, maximum governance," Gopal Bagley, spokesman of the Ministry of External Affairs quoting the Prime Minister as saying. India's growth presents a win-win partnership for the country and the US, and American companies have a great opportunity to contribute to that, PM Modi told the CEOs. "If America becomes stronger, India will be a natural beneficiary," he said. On the Goods and Services Tax (GST), Modi said its implementation is a complex task that may well turn out to be "a subject of studies in US business schools". "This shows India can take big decisions and implement them swiftly," he said. During the interaction at the Willard InterContinental Hotel, where he is staying, PM Modi gave a patient hearing to the wish-list of the top bosses. The Prime Minister pointed out opportunities for tourism through developing hotels in "PPP (public private partnership) model" at 500 railway stations, Mr Bagey said. He said his government has focused on improving the quality of life of the people, and added that working towards this end requires a global partnership. "In concluding remarks, PM stresses imp of coopn 4 start up, innovation &tapping huge intellectual, edu & vocational training potential in India," Mr Bagley tweeted. The CEOs lauded the Prime Minister's initiatives of demonetisation and digitisation of economy and the GST, the spokesman said. The CEOs also expressed support for 'Make in India', 'Digital India', 'Start Up India' and other flagship initiatives of the government. According to Indian officials, several CEOs showed willingness to be partners in skill development and education initiatives in India. They also mentioned social initiatives being undertaken by their companies in India in women empowerment, digital technology, education and food processing. Infrastructure, defence manufacturing and energy security also came up for discussion during the meeting. Mr Pichai told reporters after the meeting that they were excited about investing in India. Praising the steps being taken by the Indian government in the last three years, he said the US companies are looking forward to the roll out of the GST. "Good," said Cook as he emerged out of the meeting. The US-India Business Council (USIBC) president Mukesh Aghi said the CEOs praised the reforms being undertaken by the Prime Minister and underscore his efforts to make India a business-friendly destination. Responding to a question, Mr Aghi said the H-1B visa issue was not discussed at the meeting. Among other CEOs present at the meeting were Shantanu Narayen from Adobe, Ajay Banga from Mastercard, David Farr from Emerson, Doug McMillon from Walmart, and Punit Renjen from Deloitte Global, Jim Umpleby from Caterpillar, Alex Gorsky from Johnson and Johnson, Jamie Dimon from JP Morgan Chase, and Marillyn Hewson from Lockheed Martin. While posting a picture of the Prime Minister with the CEOs on Twitter, Mr Bagley said, "strengthening the Indo-US economic partnership". Noting that US-India trade has tripled over the last decade, reaching a historic high of nearly USD 110 billion in 2015, USIBC said there is an opportunity for both the countries to also sync their regulatory and standards system to increase trade and investment. In a separate statement, Jagdip Ahluwalia, executive director of Indo-American Chamber of Commerce of Greater Houston, said the United States and India share a very symbiotic relationship, and PM Modi's first face-to-face visit with Donald Trump is important to strengthen the relationship between the two.